REDDING, Calif. - Local sixth-graders visiting Simpson University last week weren’t there to tour campus. They had a mission. 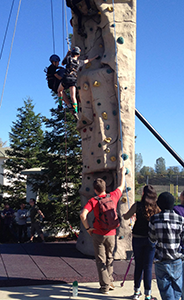 For more than three hours, the 18 students worked to “save the world” by transporting a universal “bio-hazard antidote” through a series of outdoor obstacles and up the “vector launching tower” (rock-climbing wall). The scenario, presented by Simpson University Outdoor Leadership graduate Shane Wachlin and current student Kida Raridon, was part of a team-building activity the pair conducted with a class from Chrysalis Charter School. Teachers at Chrysalis contacted the Outdoor Leadership Department, which teaches team-building, adventure education, and conflict management exercises as part of its program curriculum. The sixth-graders visited campus Oct. 28 and Nov. 4. Wachlin, a ’16 graduate who recently completed a seasonal job as an assistant instructor with Outward Bound California, laid out some guidelines that the students needed to remember: Two to four people needed be touching the “antidote,” stored in a large ball, at all times. “Toxins” were less powerful when they stayed together as a group. And while a field “anti-contamination” kit was ready in case someone got “infected,” it would lose power each time it was used. The boys and girls were first challenged to line themselves up alphabetically on a log without falling off. Then they proceeded through obstacles that included climbing bars and a rope swing. Wachlin and Raridon urged them to communicate, plan, encourage and look out for each other along the way. Alysia Krafel, sixth-grade teacher at Chrysalis, said the activities were helpful in pointing out places where the students needed to work better as a team, as well as where to improve their focus and transitioning skills. The physical challenges highlighted the natural leaders in the class as well as the natural encouragers, Krafel said. “That’s a really good thing – it pointed out some gifts that students have,” she said. Wachlin and Raridon asked for feedback from students after each activity and offered their own observations and praise. Some students overcame fears and a lack of confidence and succeeded in challenges they did not think they could do, Krafel said. “When one boy hit the other side on the rope swing, the whole class cheered, and he got up with the biggest grin,” she said. The students also learned the hard way that not working effectively as a group throughout the morning meant they ran out of time for everyone to get harnessed for the rock-climbing wall. 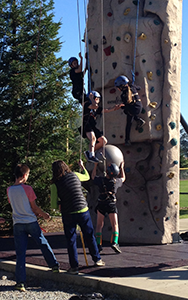 However, the climbing wall has now become an incentive for her students to earn good-behavior points in the classroom. “The ones who earn enough will be able to come back and try the wall, Krafel said. The Outdoor Leadership program focuses on backcountry skills and training but also offers training related to challenge courses, said Amy Smallwood, associate professor. Simpson University is the only private West Coast college to offer an Outdoor Leadership major and minor. The program has graduated men and women who are working as leaders at adventure companies, camps, recreation centers, and more. Top: Chrysalis Charter School sixth-graders gather around a ball containing a “universal antidote” and learn about their mission to carry the ball through a series of obstacles. Middle: Outdoor Leadership graduate Shane Wachlin, in red shirt, offers guidance to Chrysalis Charter School students attempting to carry a ball up the rock-climbing wall. Bottom: Outdoor Leadership professor Amy Smallwood, in vest, holds a rope securing Chrysalis Charter School climbers during a team-building activity at Simpson University.